The trend of working from home is only growing, and there’s no doubt why! Working from home gives you the flexibility to travel, spend more time with your family, and enjoy your weekends (and weekdays) without having to dread going into work Monday morning! 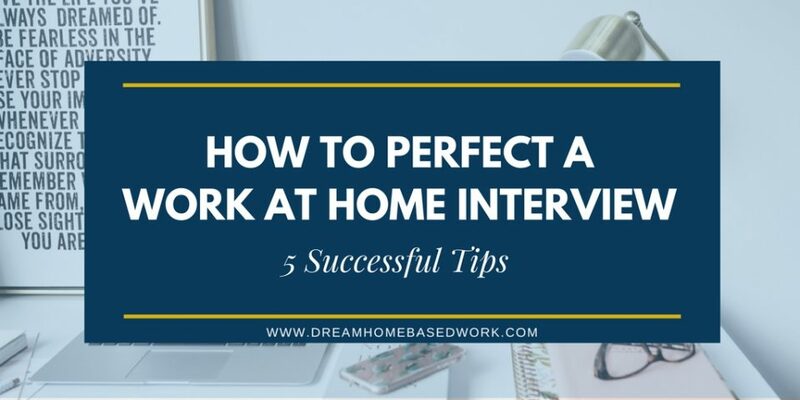 To help you score your next opportunity, here are 5 awesome tips for landing a work at home interview! Work at home interviews can come in the form of video calls, traditional phone interviews, or simply emailing back and forth with the business/person you will be working with. Be prepared for whatever format they choose to use. If you know ahead of time that it will be a video interview, take the time to look nice. Even if you’re going to be working from home, making yourself look presentable will leave a first impression that says “I’m professional.” Also, take a brief moment to tidy up the area that will be seen behind you during the interview and try to do it at the dining table or somewhere away from your bedroom or bathroom. If it’s a phone interview, take the chance to prepare your greeting and some of the answers ahead of time. You of course shouldn’t write a script to follow, but be ready for those common interview questions just in case they come up! If it’s an emailing interview, you will find it rather easy as you will get the chance to think and type out your responses. Most of the time, work at home interviews come in the form of phone or video as the businesses want to make sure you’re presentable and professional. A lot of people take the wrong approach during interviews and leave it up to the business to ask all the questions. This is a big mistake! Most people think that asking questions will make them seem unknowledgeable, but it’s actually the complete opposite. Take the time to prepare some questions ahead of time, they don’t have to be in-depth, but ask about the business, its background, and express your interest in the job. If there’s anything that isn’t clear, make sure to get your doubts settled now, before you get the job (or even lose the opportunity!). If you’re a rather shy speaker, realize it’s possible that phone interviews may actually be in the form of conference calls, meaning there may be many interviewers on the other side. Be ready to answer all of their questions. If you’re not a strong speaker or you don’t have much interviewing experience, get a friend or family member to help you practice. They can help you with some of the questions that might be asked and prepare you for answering them. Practice so that you’re prepared, but don’t go through the potential questions so many times that you end up speaking like a scripted spokesperson during the interview. You just need a small amount of practice so you can speak clearly and confidently, it’s okay to come up with answers off the tip of your head during the interview. During the interview, if they happen to ask a question that you haven’t prepared for and just don’t know how to answer, change the subject as smoothly as possible. Answer their question as much as you can, and lead into another topic. You can also try asking one of your questions after a short reply to re-direct the interviewer’s attention to something else. This is helpful if you completely freeze during a question and have no clue what to say. Interviews shouldn’t be the question, you answer. Good interviews come across like a conversation. When they ask a question, answer in a complete sentence. Don’t just stop after a few words and wait for another question, make it into a conversation between you and the interviewer and you will find that it goes a lot more smoothly. This is relatively easy to do, once you get your first question, answer in full (as much as possible), and then continue speaking about relevant topics or ask the interviewer a question. Interviews aren’t just for the business to get to know you, it’s so you can learn more about the company and what your position will require. Talk to them, don’t just answer their questions! If you follow these five tips, you’re sure to land your next work at home opportunity easily! Remember to be professional, polite, and always be cordial. Good Luck to Everyone! Asking questions is really important! It shows the interviewer you’re serious and generally interested in the position and the work preferences of the company.